March is National Craft Month and in honor of crafting, Wayfair asked a few bloggers to re- do the first craft published on their blogs. I’m so excited to be one of those bloggers. It was interesting to look back and find the first craft I ever posted (no, I couldn’t remember.) It turns out the craft that inspired it all and the start to my little blogging adventure was cloth napkins! Looking at it now, it makes perfect sense. Probably no other post reflects the reason I wanted to start a blog more than that first craft. My desire was to show people how crafts and sewing could save money and enhance our lives. I feel like my cloth napkins post did exactly that. I’m excited to have the chance to take a trip down memory lane and to redo this old project. Since that project was created four years ago it seems like a good time for an upgrade. 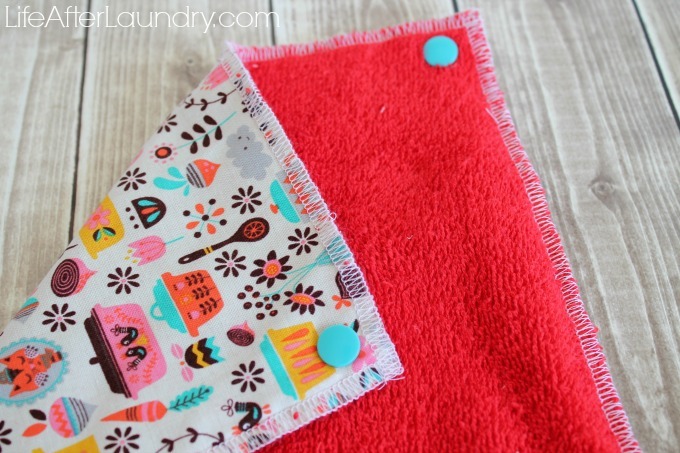 Inspired by those first cloth napkins I decided to create Easy UnPaper Towels. These UnPaper Towels are versatile enough to be used for all of life’s messes, but pretty enough to still be used at the dining room table. 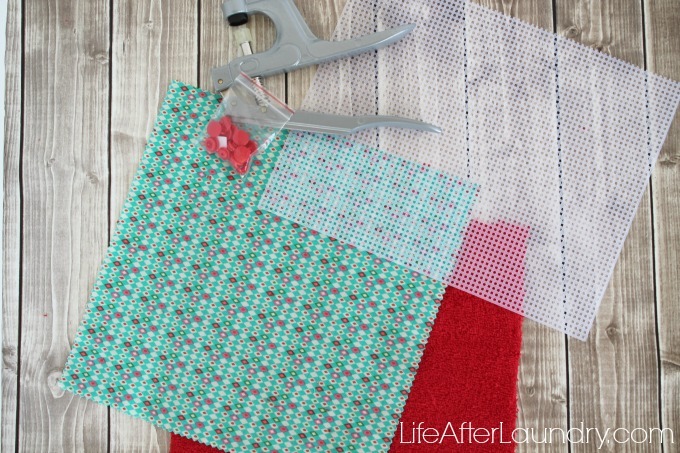 Fabric: 2- 10″ squares for each UnPaper Towel you are wanting to make. 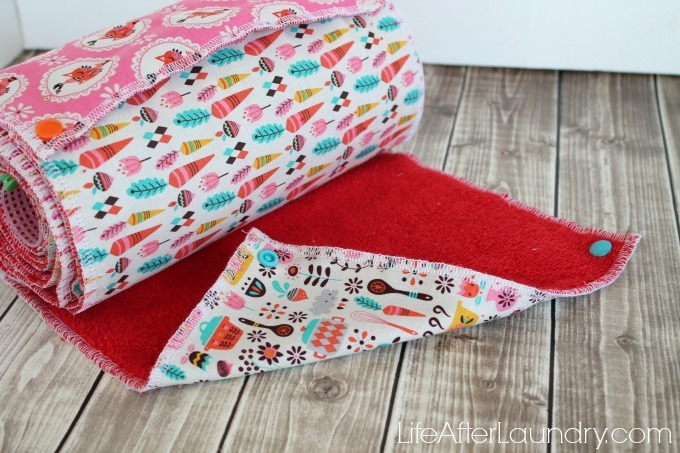 We used terry cloth and a 10″ stacker of Vintage Kitchen fabric. Using a stacker made the UnPaper Towels that much easier, since it was one less thing that needed to be cut. I have also seen UnPaper Towels made with flannel on both sides, so it’s really a personal preference. Once you have your 10″ fabric squares cut, you can lay them right sides facing out and serge along the edge. If you don’t have a serger you can also zig- zag the edges on your sewing machine. 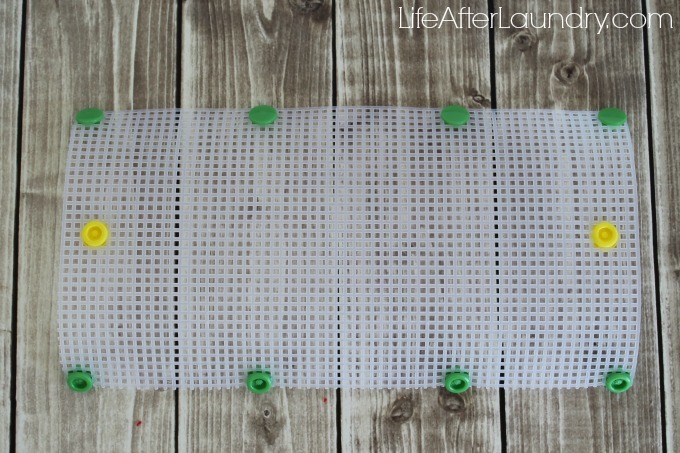 Add the Kam Snaps to each corner of your UnPaper Towels, below your stitches. On one side of your UnPaper Towel place a cap on top with the stud on the back, and the other side will have the socket on top and the cap on the bottom. Just be consistent, you will have snaps in all 4 corners and 2 need to be the same on one side and the other 2 be the same on the opposite side. The plastic canvas is used to snap your UnPaper Towels too. 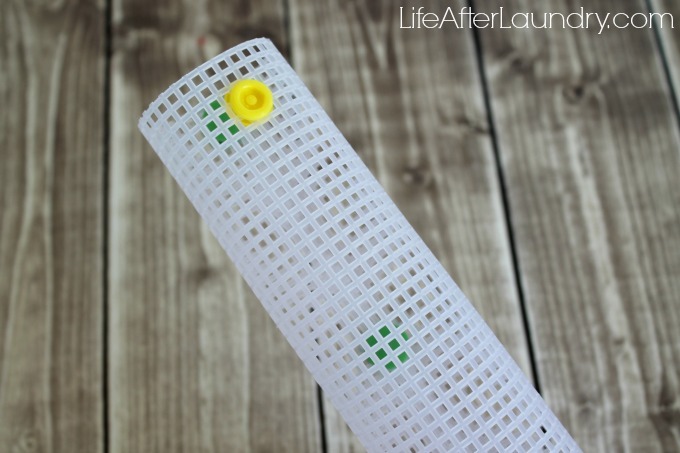 Use a small rectangle piece of plastic canvas to form a tube and connect it together with your snaps. Add two snaps in the middle of your plastic canvas tube. This will allow you to attach your UnPaper Towels and form a roll. 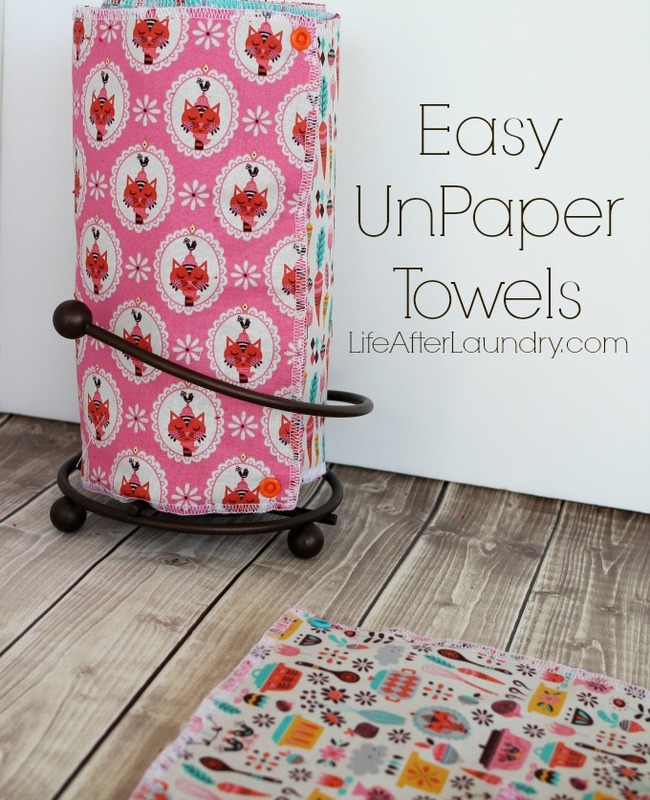 There you have it… Easy UnPaper Towels, a reusable cloth option to sit right where you old paper towels used to be! Thank you again to Wayfair for the opportunity to be part of this campaign. It was a great reminder of why I have a craft blog, and why I do what I do. I hope you feel inspired to spend a little time crafting, whether it’s to relax, create something beautiful or my favorite reason, to save money. Be sure to check out Wayfair’s art and craft supplies and their awesome craft storage solutions. Thank you, Susan! That is exactly what I do, hide the paper towel for the really gross messes. Really cute. 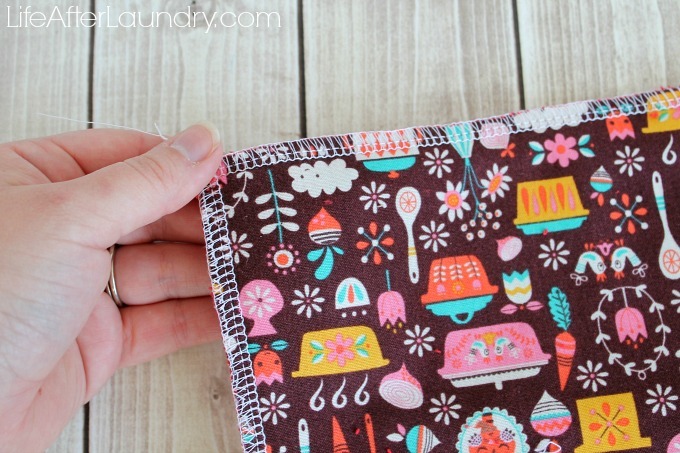 I just use old kitchen towels that have been retired from the kitchen, but these are so much more cute. I had no idea they would be so easy to make. Fantastic! I love the fabric too. I’m always learning something here. Love these! I’ve been wanting some for years and now I think I’ll actually make them! Those are adorable!! I love it when you can reuse something! Pinning this! The plastic screen on the inside is genius. We just used paper towel rolls to roll ours up on, but it’s getting pretty beat up after 6 months (its our 3rd in a year). These are amazing, I wanted to buy some but am definitely making them this weekend during our snowstorm.